I'm putting in MB750's for beaver and its been some time since I've trapped beaver. Can anyone tell me how far below the water level the trap/pan should be and how far out from bank? I'm looking at going with a pocket type baited set dug into side of bank. I've searched the archives and simply can't see it anywhere. Thank you! When u say up close n offset do you mean as in like a fox dirt hole set tight? Rite next to bootom edge of the dug portion of the bank? I like to set the trap at least 8" deep to promote a back foot catch, with one of the levers tucked fairly tight to the edge of the drop off, and offset about 6" from center. Also just in case you may have forgotten, always turn the trap so that the levers are perpendicular to the bank, you want the jaws to hit the sides of the foot as opposed to the front and back. Thanks guys for the info! 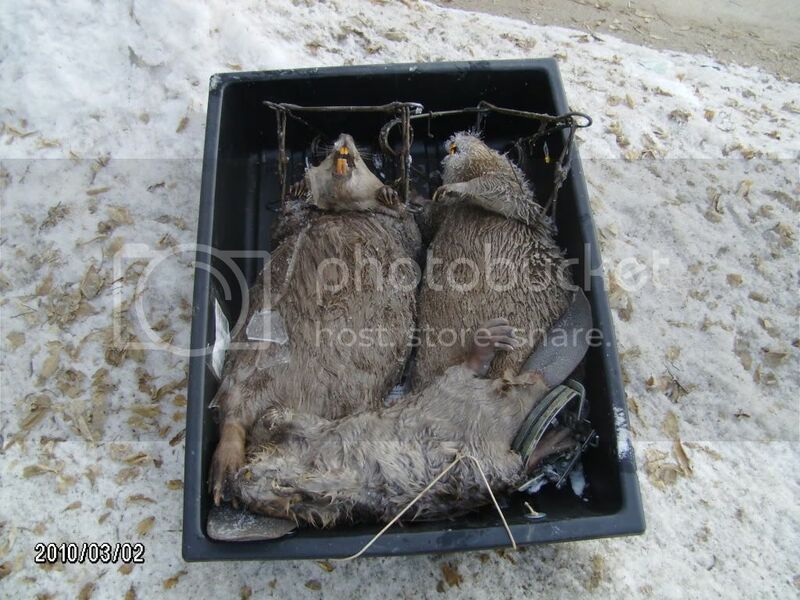 I ended up putting in 4 traps total 2 Connie's n 2 750's. Update: connected!!! Thanks for all your help gang! This site rocks!!!!! One in 330, the other "BARELY" in a 750. NICE!!! Congrats on your catch..
Now I can't figure out what part of it to use for bait? WOW!!!! How do u get em to hop into the sled? after skinning and removing the castor, I chunk any meat that I can cut off the bone for bait. Yep, just bone it out like a deer or any other meat critter. Ok, I'm not real smart. Would I be best to use the castor by itself for k9's? Or would just the meat be best? Take the castors out in one piece. They can be dried and ground or tinctured to get a liquid castor solution. The meat should be used separately, preferably mixed with some bait solution. The owner of this site sells a great bait solution to mix with your chunks of beaver meat. The castor can be ground, then add some glycerin to it to make a good lure for K-9's, cats, beaver.....well almost anything with fur will be attracted to castor.. Thanks! What type of bait solution? It's just called "bait solution". Available at any of the trap suppliers that support this site.